We go into Saturday’s fixture off the back of three positive results against Poole Town, Harrow Borough and Staines Town with convincing performances to propel us up the table into touching distance of the playoffs. Saturday’s visitors come to us off the back of a 3-0 defeat to promotion chasing Met Police and although they currently sit second bottom in the table, they are by no means down. They have taken 24 points from 26 games having won 16, drawing only 3 and losing 16 games. Gosport currently sit above the dotted line with a 5-point advantage over Frome and they will come to the Webbswood Stadium with a point to prove knowing three points is a must to give themselves the best possible chance of survival. The talented Danny Greaves is the man in charge of Frome having moved over from Wiltshire based side Bradford Town in the summer. Danny has built up an experienced squad including a number of players with many Southern League appearances to their name but they will be disappointed at the departure of proven goal scorer Jordan Rogers to Bristol Manor Farm a couple of weeks ago, however, Frome have plenty of quality and experience to pull them through and out of the relegation zone and they will want to start their pursuit with a win this Saturday. The Gogglebox star signed for Frome from National League South team Weston-super-Mare and the well-travelled attacker will be a danger to the Marine back four. 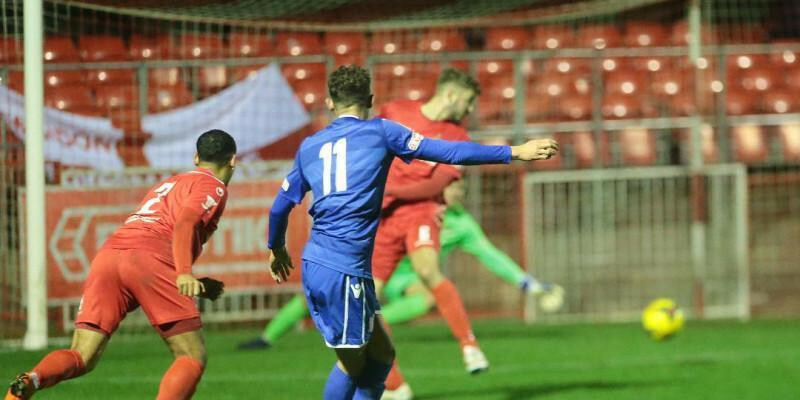 The former England U18 international has faced Marine in his first game for Frome and also played here for Hereford in the 2016/17 season, and the lively attacker is always a threat when on the ball. Marine’s last home defeat coming one game prior to the last time they played Frome in mid-November. That 2-1 win for Marine at Frome was the start of their significant upturn in from where they moved from one place above the relegation zone to two places off the play-offs in the space of two months. Spalding recalled the previous meeting between the two being a difficult contest and is expecting nothing less this time around, despite the two clubs’ seasons heading in opposite directions since. He said: “When we played them at their place earlier in the season, they were a decent side, I thought. “We managed to get the win but given the previous game, I’m expecting a tough game on Saturday to be honest. “They got beat 3-0 by Met Police in the last game out, but they did beat Wimborne the game before that, so it will be another tough game for us – they’re a good footballing side, they look to play and they’re going to work us. “We’ll need to be at our best again to make sure we get anything from the game.” Since their breakthrough victory against Frome on November 20, Marine have shown promotion-winning form having won seven, drawn three and lost just twice. Spalding attributed their rise up the table to a significant shift in work-rate and has called on his players to continue the recipe that has often delivered success until the end of the season. He said: “I need to keep telling the players how important it is that we keep working hard. We got our success through working hard, everyone buying in to what we’re doing. “We’ve managed to get a couple of wins on the road recently – we’ve had three wins on the spin now and we’re looking to make sure we go into Saturday and do everything we can to see if we can make it four in a row.